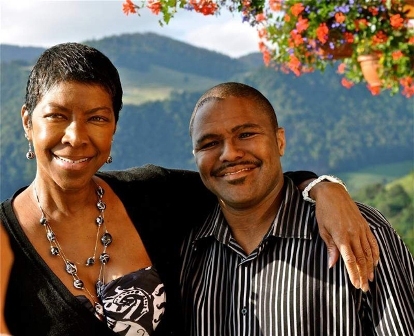 Memorabilia and other personal property owned by the estate of Natalie Cole’s late only child is being put up for auction, including records of various artists, jewelry, paintings and even some dinnerware. Robert Yancy died Aug. 14, 2017, at age 39. His body was found in his Sherman Oaks apartment by a friend who stopped by to check on him after not hearing from him for several days. Estate administrator Brandie Yancy, who lives near Chicago, says in documents filed Monday in Los Angeles Superior Court that the compilation of items will be sold after Aug. 7 “without court supervision.” She and Robert Yancy had the same father, but different mothers. The items to be put up for bid include records by Nat King Cole, Natalie Cole, Dionne Warwick, the Jackson 5, Joe Cocker, Elton John, the Temptations, Willie Miller, the Rolling Stones, Billy Preston and Marvin Gaye; a vintage Natalie Cole-themed wall plaque with clock; digital photos featuring Natalie Cole; a sterling silver necklace and earrings; a crystal flower vase; a city of New York proclamation of “Nat King Cole Day” and a vintage Natalie Cole “Thankful” album wall mirror. Still other items include a Gianni Versace Signature Medusa gold- plated stainless steel wristwatch, 14-karat pearl, diamond and marcasite earrings, a city of Los Angeles proclamation to Natalie Cole, a digital photo of Ray Charles, a mid-20th century watercolor painting of clowns and a Noritake Bone China dinnerware set for 10. Robert Yancy’s father was the first of Cole’s three husbands. He died of a heart attack in 1985 at age 34, when Yancy was 7 years old. Natalie Cole died in December 2015 at age 65. Yancy’s grandfather, famed singer Nat King Cole, died of cancer in 1965 at age 45.